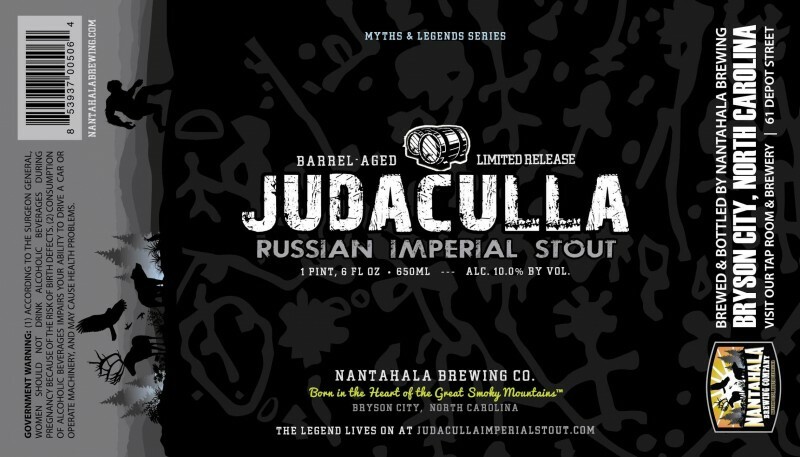 (Bryson City, NC) – On Tuesday, December 20th, Nantahala Brewing Company re-released Judaculla Barrel-Aged Russian Imperial Stout. Brewed once-a-year, this luscious 10% ABV whiskey barrel-aged stout arrived at the brewery to much fan fare. When writing Judaculla’s recipe in 2011, Nantahala Brewing Head Brewer Greg Geiger and Owner Joe Rowland strove to create a beer that blended the flavors of a Russian imperial stout with the tannins and vanilla present in whiskey barrels. To make the beer unique to the brewery, they decided to search for a flavor native to the region that they could also add. To find the correct ingredient, Geiger and Rowland talked to numerous members of their community and collected a variety of beverages with flavors they thought would complement their Russian imperial stout. The two identified sorghum — a vital ingredient in the traditional root beer produced in the Western North Carolina mountains — as having deep molasses notes, a flavor that would beautifully meld with vanilla, chocolate and whiskey notes. Once Judaculla went into production, it became clear the process to create the beer would be a long and skillful endeavor. After the base beer is brewed with the sorghum, it is moved into freshly dumped Jack Daniels whiskey barrels to capture big flavors of vanilla and oak. Aged between 3 and 4 months, the beer is then blended with a freshly brewed roasty and hoppy stout. The exact blend percentage is dictated by the brewer’s palate. The resulting beer takes approximately 6 months to make and beautifully blends flavors of oak, molasses, vanilla, and roast. Five years later, he same techniques are used to create the beer but the flavors are continuously enhanced as the brewers perfect the recipe over time. Judaculla is released each December when the weather turns cold enough to justify this warming and decadent drink. Twenty-two ounce bottles are currently available in Nantahala’s Bryson City taproom and will be available on shelves in grocery stores and bottle shops in Western North Carolina in the following weeks. Founded in 2009, Nantahala Brewing Company creates award-winning beers in the shadow of the Great Smoky Mountains National Park. A proud supporter of the Appalachian Trail Conservancy, Friends of the Smokies and Great Smoky Mountain Association, the brewery’s beer, culture and vision are defined by the park’s wild spaces and its untouched, natural water that flows from one of the purest, protected watersheds on the planet. Nantahala Brewing is known for such adventure-inspired flagships as Dirty Girl Blonde Ale, Noon Day IPA, App Trail Extra Pale Ale, and Bryson City Brown Ale. In addition, the brewery seasonally releases Little Tennessee Logger, 4-Foot Drop Pale Ale, Devil’s Courthouse Belgian Golden Strong, 8-Foot Drop Double IPA, Hellbender Hefeweizen, Rivers End Oktoberfest, Pattons Run Porter, Chocolate Covered Cherry Stout, Nantahala Pale Ale and Sticky Dog Stout and is known for their specialty Trail Magic series. These beers can be found in six packs and on draft in grocery stores and restaurants across North Carolina and Tennessee.